December 25, 2010 by rwb, under Blognote. This year is one of interesting year for the ermicroblog readers, as we all could start to learn how to make use of Ethernet connection with the embedded system such as Integrating Wiznet W5100, WIZ811MJ network module with Atmel AVR Microcontroller project also this year I continue to post some basic electronics knowledge such as Working with the Comparator Circuit project and I will continue to post both advance embedded system project as well as the basic electronics knowledge on the year 2011. As you might notice that during this year I also update one of the most visited articles Using Transistor as Switch to include the TIP121 H-Bridge and Driving Stepper Motor circuits; I will continue to apply this similar style to other articles with the necessary and updated information. Actually this year I would like to close with the “Robotics Project” but unfortunately I could not finish it before Christmas due to some of the other project that I have to handle at the same time. 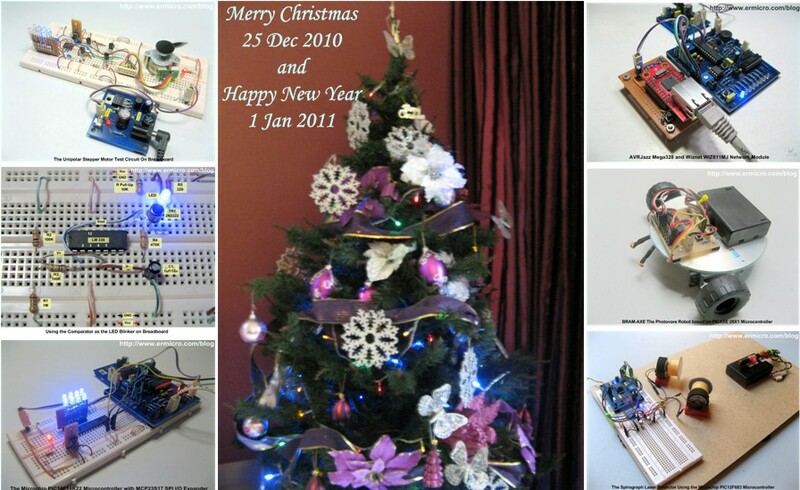 I will post this project on the first month of year 2011 and I promise you that this project is one of the simplest and coolest robotics projects that you could ever found on the internet. I would like to thanks to all the ermicroblog readers for your support and encouragement, during this year the ermicroblog website is visited more than 1000 visitors per days (i.e. more than 1800 pages viewed per days). I would be glad to hear a feedback regarding the ermicroblog website contents as well as the suggested articles or project from you. I do hope this blog could bring a better understanding of how we could make use of the electronic and microcontroller in our learning journey or just for hobby and fun. Thank you to all of ermicroblog readers, may this Christmas will bring joy in your heart and good hope for this coming year. Merry Christmas 25 December 2010 and Happy New Year 1 January 2011. Have a fun and nice holiday may our Heavenly Father always bless you and your families.